Giorgio Armani Beauty has exalted women’s beauty for 15 years, offering innovative and sophisticated formulas with ultra-natural results. All Armani beauty make-up boasts sensorial textures, refined colours and minimalist packaging. Today, ROUGE D’ARMANI takes centre stage with Canadian actress Sarah Gadon, ambassadress of Giorgio Armani Beauty make-up. “I love red lips, because they always look glamorous. For me, applying lipstick is a sensual step that can boost a woman’s confidence. As soon as you apply ROUGE d’ARMANI, you know that its cutting-edge formula is like no other. Rouge d’Armani is now a must-have Giorgio Armani make-up product for even the most demanding women. This satiny couture lipstick is used every day by make-up artists around the world. Its gentle, lightweight formula promises exceptional colour hold and comfort for six hours straight. 15 years ago, the Giorgio Armani Beauty laboratories patented the “Micro-fil™” process, inspired by the couturier’s very specific choice of fabrics. Make-up was crafted like tailor-made “clothing” for the complexion with a “second skin” effect uniting radiance, sheerness and subtlety. Adapted to lipstick, this technology now becomes “Colour Fil” thanks to the magic of “Colour Bond,” based on seven years of research and protected by 12 patents. On application, a totally imperceptible 3D mesh ensures flawless colour hold. Colour is locked in for eight hours, without fading or feathering. Light reflection is boosted and lips are intensified in one silky caress. – Emollient agents and micronised waxes glide over lips and improve comfort for easy application. – Spherical micro-pigments join the “Colour Bond” technology, enriching colours to make them dazzle. – Two lightweight oils, in perfect affinity with the lips, respectively provide comfort and a satin smooth finish. – Colour doesn’t fade or feather* for eight hours. * The lip contour stays perfectly defined. Self-assessment by 63 women with all lip types who tested ROUGE D’ARMANI for one week. These new shades join the 11 iconic shades, including N°400, for a complete palette of 24 colours. 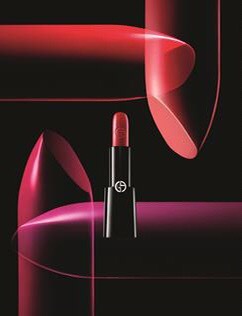 ROUGE d’ARMANI slips into a minimalist black lacquered tube and clicks shut with an exclusive magnetic closure. swept on with a sponge applicator to offer a velvet matte finish, while the classic Rouge d’Armani lipstick is applied directly to the lips for a satiny finish. Sheer, dazzling shades with a moisturising formula. A comfortable lipstick that’s easy to wear anywhere, anytime, and a sophisticated concentrate of colour and extreme shine.